It seems something is lurking out there but stargazers don’t know what it is. Measurements taken from the movements of distant objects in our solar system suggest there is a ninth planet way out beyond Neptune. iTS in the huge wasteland of icy debris called the Kuiper belt. Now you can join in and help find the elusive object. Astronomers from NASA and the University of California, Berkeley, want you to trawl through thousands of images taken by NASA’s Wide-field Infrared Survey Explorer to see if you can spot Planet Nine. “Automated searches don’t work well in some regions of the sky, like the plane of the Milky Way,” said Aaron Meisner, a postdoctoral researcher at Berkeley. “There are too many stars there, which confuses the search algorithm.” That’s where you come in. Dr Meisner has teamed up with NASA astronomer Marc Kuchner to try to pin down Planet Nine in a project called Backyard Worlds. Data from those “Trans-Neptunian Objects” were the first indirect evidence that such a planet might exist. Caltech astronomers Mike Brown and Konstantin Batygin last year said that from this data Planet Nine would likely be two to four times the Earth’s diameter, and 10 times its mass, orbiting the sun every 15,000 Earth years. Brown dwarfs form like stars, but then evolve like planets. They never become dense enough to ignite the fusion reactions required to make stars burn. WISE images have already allowed astronomers to identify hundreds of previously unknown brown dwarfs, including the sun’s third and fourth closest known objects. Professor Chris Tinney at the University of NSW is a brown dwarf hunter. He said that the Backyard Worlds project was definitely something worth doing. “I don’t think they will find Planet Nine – as I don’t think it’s there. But there are possibly other classes of objects to be found in the WISE data,” Professor Tinney said. “If they find anything new it will be very exciting,” he said. The techniques used to identify these types of objects is similar to that used by Clyde Tombaugh to identify Pluto in 1930. Back then, glass photographic plates were compared to find a moving dot against a background of stars. The principle to find Planet Nine is the same, but the technology is very different. NASA’s WISE telescope scanned the entire sky between 2010 and 2011 building the most comprehensive survey of mid-infrared wavelengths available. By comparing frames of the same part of the sky, astronomers – and you – can look for moving objects, which might turn out to be the distant planet. ANU is launching a search for a new planet in our Solar System, inviting anyone around the world with access to the Internet to help make the historic discovery. Anyone who helps find the so-called Planet 9 will work with ANU astronomers to validate the discovery through the International Astronomical Union. ANU astrophysicist Dr Brad Tucker is leading the project, which is being launched by Professor Brian Cox during a BBC Stargazing Live broadcast from the ANU Siding Spring Observatory. “We have the potential to find a new planet in our Solar System that no human has ever seen in our two-million-year history,” said Dr Tucker from the ANU Research School of Astronomy and Astrophysics. Dr Tucker said astronomers had long discussed the likelihood of a ninth planet on the outer edges of the Solar System, but nothing had been found yet. “Planet 9 is predicted to be a super Earth, about 10 times the mass and up to four times the size of our planet. It’s going to be cold and far away, and about 800 times the distance between Earth and the sun. It’s pretty mysterious,” he said. 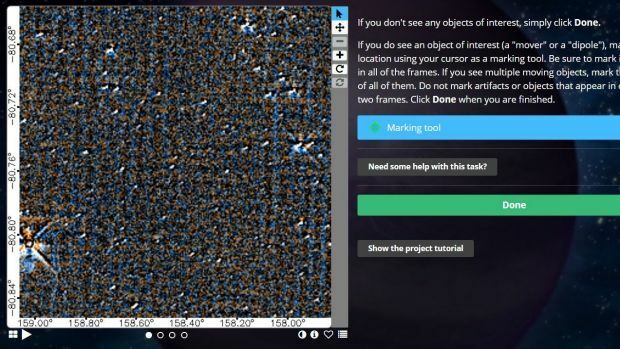 The ANU project will allow citizen scientists to use a website to search hundreds of thousands of images taken by the ANU SkyMapper telescope at Siding Spring. SkyMapper will take 36 images of each part of the southern sky, which is relatively unexplored, and identify changes occurring within the Universe. Finding Planet 9 involves citizen volunteers scanning the SkyMapper images online to look for differences, Dr Tucker said. “It’s actually not that complicated to find Planet 9. It really is spot the difference. Then you just click on the image, mark what is different and we’ll take care of the rest,” Dr Tucker said. He said he expected people to also find and identify other mystery objects in space, including asteroids, comets and dwarf planets like Pluto. “If you find an asteroid or dwarf planet, you can’t actually name it after yourself,” Dr Tucker said. “But you could name it after your wife, brother or sister. We need to follow all of the rules set by the International Astronomical Union.”Dr Tucker said modern computers could not match the passion of millions of people. “It will be through all our dedication that we can find Planet 9 and other things that move in space,” he said. Co-researcher and Head of SkyMapper Dr Chris Wolf said SkyMapper was the only telescope in the world that maps the whole southern sky. “Whatever is hiding there that you can’t see from the north, we will find it,” Dr Wolf said. From 28 to 30 March at 8pm London time, BBC Stargazing Live hosted by Professor Cox and comedian Dara O Briain is expected to be viewed by around five million people.